With graceful intention, Steelite International introduces the stunning new Plateau collection designed by award-winning Martin Kastner for Crucial Detail. This timeless, subtle design seamlessly marries form and function creating a fresh take on a blank canvas for chefs everywhere. Elegant in its simplicity, this collection lifts the flat plate above the table’s surface for ease of transport without compromising presentation. A subtle relief in the center allows chefs to build on the high and low points of each piece, creating a gentle play of light and shadow on a pure geometric form. 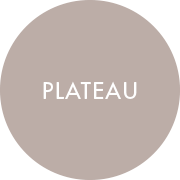 Elevate your own presentations with Plateau.